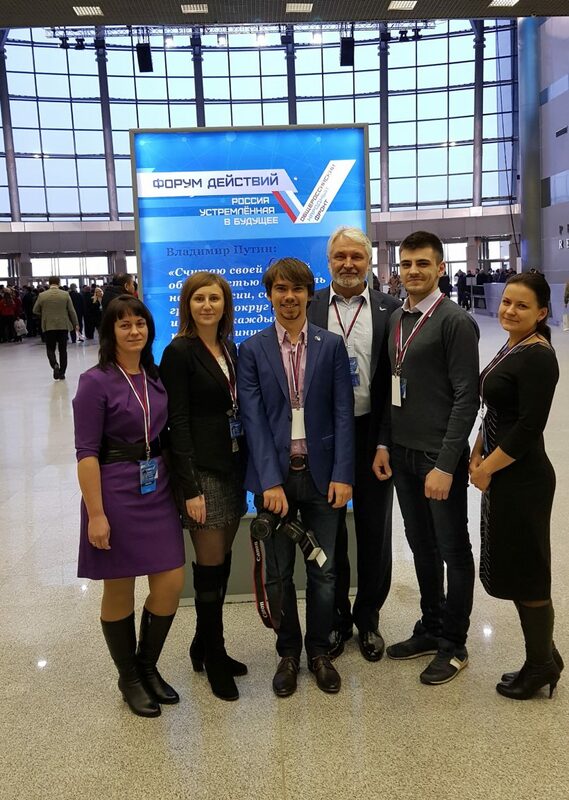 The young specialists of the plants of “Elinar” group of companies with the General Director I.E. Kuimov took active part in the final “Platform of Actions” of the All-Russia People’s Front called “Russia directed to the future”. The All-Russia People’s Front was established in May 2011 initiated by the President of Russia V.V.Putin. “Platform of Actions” was held for the forth time and became the most large-scale in the history of the All-Russia People’s Front activity. More than 4 th. people took part in it, in particular: managers of the federal authorities, federal and regional journalists, employees of the commercial and non-commercial companies – the activists and experts of the All-Russia People’s Front, the active young people from the different regions of the country. The vigorous and interesting debates on the important topics for our country were being held: “Ecology of the future: the stable development”, “Economy of the future: the digital country”, “Territory of the future: the new spaces”, “Medical industry of the future: Healthcare”, “Education of the future: the new school”, “Youth team of the All-Russia People’s Front”. According to the results of the active discussions on each topic, the relevant proposals were formed which would become the basis for the further work of the activists of the All-Russia People’s Front in cooperation with the President Administration and the Government of the Russian Federation. On the closing day of “Platform of Actions” Vladimir Putin, the President of Russia, the leader of the All-Russia People’s Front took the stage. He stressed that the overarching aim of the All-Russia People’s Front is to support the people, to contend the truth and fairness. The President noted: “All of us, big and small, as our people say, should remember that Russia, our nation and, actually, all of our families passed very hard period of our history last century: revolutions, wars, radical changes of the whole course of life. Nowadays we are obliged to keep our statehood and freedom, stability and harmony in the society. We should keep everything we’ve already reached, even the plain things, in order to let our achievements and the real changes for the better be inconvertible, to let our strength be directed to the benefit and development of Motherland! I see this as our common task, the personal duty and the civic and human responsibility, and as the acting head of state and the candidate for the President of the Russian Federation. The strong Russia directed to the future is needed for all of us and everything depends only on us!” – the President stressed.